Steven (Chicagoland, United States) on 11 June 2010 in Art & Design and Portfolio. One of the five main water areas of the Franklin Delano Roosevelt Memorial in Washington, DC. 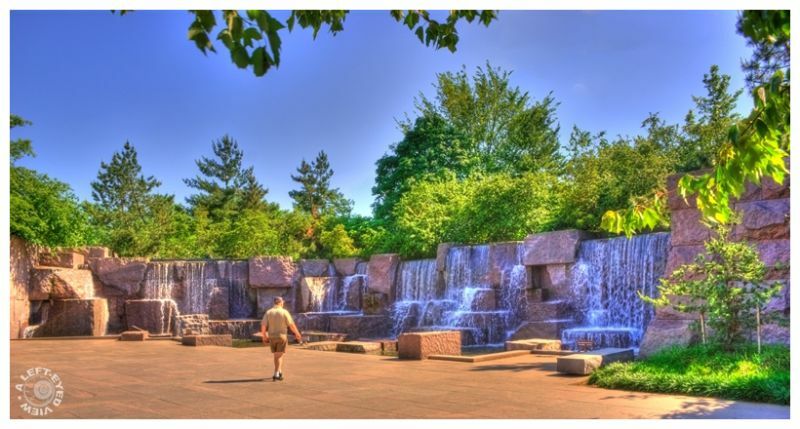 This waterfall is described to be a conglomerate of all the waterfalls located in this memorial park representing a retrospective of Roosevelt's presidency. It is said that water is a prominant feature throughout the Roosevelt memorial because Roosevelt found so much relief from the ailments of polio through relaxing and swimming in water. It was through Roosevelt's efforts that a young doctor named Jonas Salk became instrumental in developing a vaccine that would virtually eliminate the disease poliomyelitis. Nice place and peaceful garden. Stunning HDR tone mapping. Great HDR job Steven - I felt terrible when we were there it was just packed and I could not get anything close to a different picture - it was at the end of the afternoon a few years ago. Really nice perspective here. Beautiful garden . Love this waterfall . Nice processing ! Nice array of colours that you have pulled out of the stonework, it works well for me. A superb photo and beautiful garden. Have a lovely afternoon Steven. A lovely image of this beautiful monument. Beautiful shot! love the colors and landscape! Looks like a post card, beautiful picture! This is a most enlightening series . . such a sense of involvement comes across. This is sure some Memorial. I guess maybe I'm not recognizing the significants of the falls here.. but the 'rock' formation reminds me of the rock enclosures at the Brookfield Zoo. Now.. I like the zoo so that's not a bad thing! Here the processing is again stunning! The color of the water and tones of the trees are remarkable!